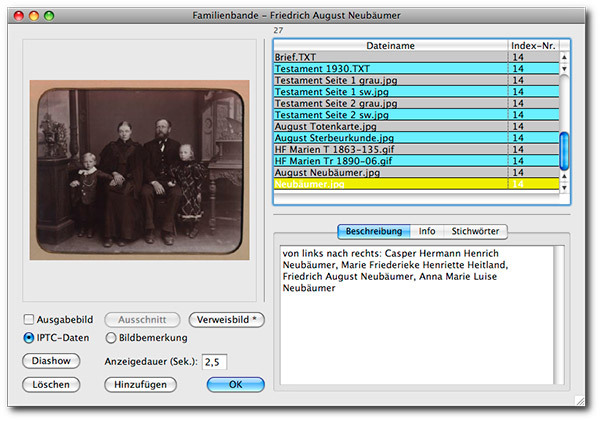 Familienbande, aka Family Ties or Family Bonds (depending on translation) is a free German-based genealogy application for Mac, Windows, and Linux systems that dates back to at least 2005, and can be run off of a USB flash drive or optical media. Translations for other languages are included (see details below). 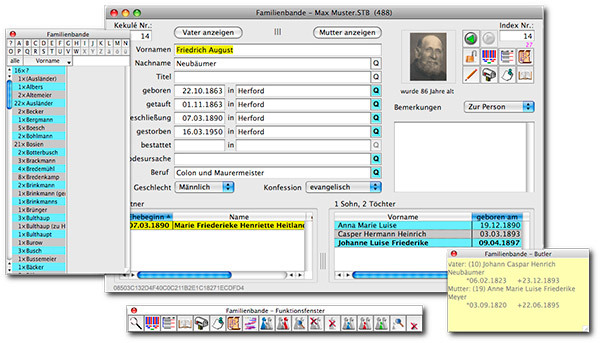 It supports the FOKO Research/contact database, up to 31 generations, and includes utilities to check plausibility, date/age calculations, as well as support for image mapping. After import, detailed log of errors is generated. Online Services Support: Supports FOKO - Forscher Kontakte (Researcher Contacts) which is a database of names. See FoKo.genealogy.net for details. LDS Ordinance Support (Information): Not sure. 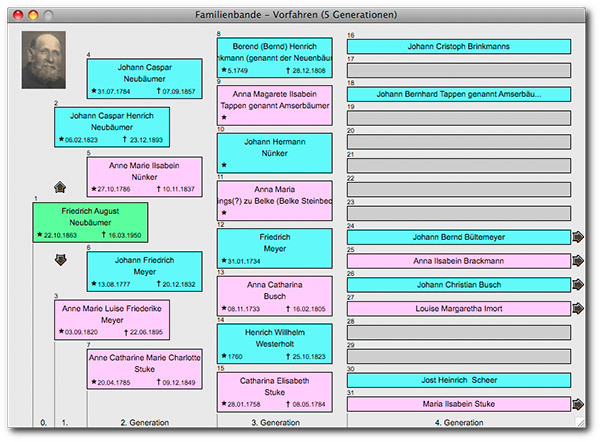 Other Useful Links: GEKo - GEDCOM Encoding Converter by the Familienbande author. Converts encoding GEDCOM files to a proper format without changing the genealogy data. Handles ASCII, ANSEL, UNICODE, UTF-8. GenLex - Genealogical Dictionary by the Familienbande author. Series History: Dates back to at least 2005. Version history at MacGenealogy.org for details between 2005 - 2010.